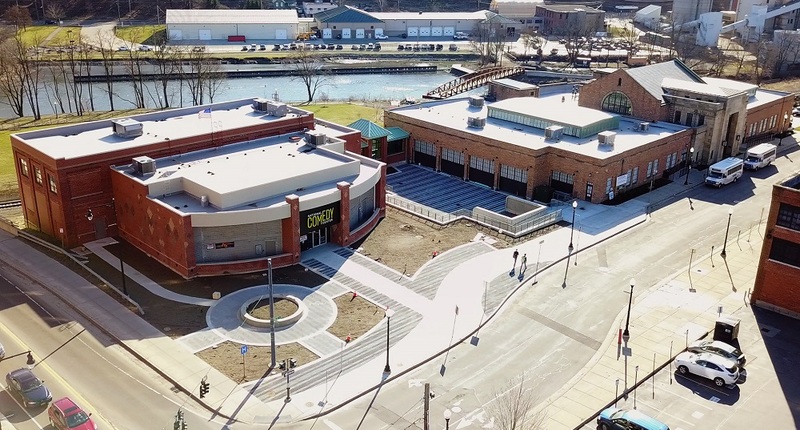 JAMESTOWN, NY – The acquisition of the Gateway Train Station (formerly “Erie-Lackawanna Train Station“) and its surrounding property by the National Comedy Center in the Summer of 2017 was the culmination of a 25-year renovation and development effort that featured a combination of public and private investment, as well as coordinated efforts on several local fronts. That’s according to Jamestown Mayor Sam Teresi, who provided WRFA with his timeline of events going back more than 25 years to help clarify any confusion over the project, as well as to highlight the numerous steps involving the city’s acquisition, development, and eventual disposition of historic property. Teresi is familiar with the history of the development of the structure because prior to being elected mayor in 1999, he had served as the city’s Development Director throughout the 1990s, meaning he was there in 1992 when the dilapidated structure first came on the city’s radar. According to Teresi, in March 1992 the Jamestown Urban Renewal Agency (JURA) purchased the train station from the property’s previous owners, John Evan with about $120,000 in funding from the federal Community Development Block Grant program. The mayor said even at that time, the train station was in poor condition and would have required significant money for restoration and development. 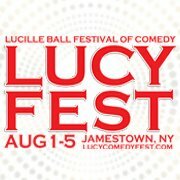 It’s worth noting that around the same time JURA was working to acquire the train station, a group of local stakeholders, including the Arts Council for Chautauqua County, were developing a concept to make Jamestown a national comedy attraction, building off the Lucille Ball connection and the recent success of the Festival of New Comedy at the time. According to Teresi, the project being developed was a “National Comedy Center and Hall of Fame,” with the train station serving as a possible location. However, none of the local foundations at the time felt confident enough in the project to support it, and it eventually was shelved and the celebration of Lucy moved in another direction over the next several years. Meanwhile, JURA maintained possession of the property for the next 14 years as officials worked to identify and secure enough funding to begin the restoration effort. During that period the train station was placed on both the New York State Register of Historic Places and the National Register of Historic Places in 2003. According to the mayor, in 2005 JURA was able to secure a total of $6 million through the federal transportation bill that was secured with the help of Senators Charles Schumer and Hillary Clinton, along with Rep. Brian Higgins. A media release from Congressman Higgins at the time says the number was actually $2.6 million, although that could have been funding for just one year, while Teresi’s figures were the funding totals over multiple years. The funding was the leverage needed to help raise other money from not just the state, but local funders as well, including the Gebbie Foundation. In May 2008, the ownership of the train station was transferred from JURA to the city of Jamestown at no cost, which allowed the city to raise more funding for development that it would have been unable to qualify for otherwise. That year the city also entered a property management agreement with the Downtown Jamestown Development Corporation (DJDC). According to Teresi, the city felt that it could maximize renovation funding by utilizing the federal Historic Tax Credit (HTC) program, but only for-profit entities are eligible to participate in that program. They mayor said that in April 2010 the property was transferred to a spinoff for profit-entity called Downtown Jamestown Revitalization, LLC (DJR), which was created in 2004. DJR was be controlled by a board of directors that included the Mayor of Jamestown, the DJDC board president, and the president of the Gebbie Foundation. Each voting member also had a designee to act in their place when necessary. The designees were the city development director, the Gebbie Foundation executive director, and another board member from DJDC. Once incorporated, DJR served as a holding company for the train station and would be able to apply for and then sell off HTCs to investors to help with the redevelopment effort. In order to avoid paying taxes on a property, the DJR received a tax abatement from the Chautauqua County Industrial Development Agency (IDA) that would continue during the lifetime of DJR ownership. Once in possession of the train station property, DJR initiated its plan for how it would eventually use the property. That plan involved marketing the soon-to-be renovated train station to private development. But because it participated in the HTC program, DJR was required under law to maintain ownership of the property for at least five years from the time the HTCs were sold to investment groups. The plan was to have DJR identify developers and, if one was found before the five-year requirement was up, it would lease the train station to the developer with an option to transfer ownership. Teresi said at the time DJR developed its plan, it didn’t have the National Comedy Center in mind, considering it hadn’t even been conceptualized yet by the officials with the Lucille Ball-Desi Arnaz Center for Comedy. Instead, DJR hoped to have developers come forward and present plans until a viable plan was presented. 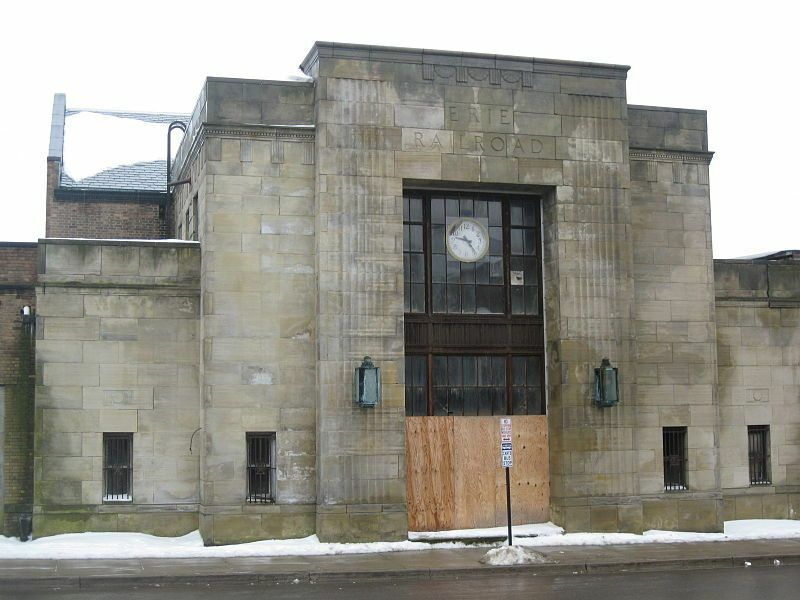 By August 2010, enough money had been raised to begin the train station renovation and ground was broken. In October 2012, the renovation was complete and the ribbon was cut on the new facility. During the time period between 2010 and 2012, the Lucy-Desi Center had transitioned to a new board and new executive director (Journey Gunderson). The new leadership worked to re-energize the organization and put it on a new path. As a result, it developed a strategic plan featuring its Legacy of Laughter “four pillars,” which included the Lucille Ball Comedy Festival, a comedic arts education program, comedy film festival, and the establishment of the first national comedy museum and hall of fame. Both 2011 and 2012 were successful years for the Lucille Ball Comedy Festival and in the fall of 2012, Gunderson and Lucy-Desi Center board president Tom Benson shared their plan for developing a national comedy attraction with the Jamestown City Council and mentioned the train station as one of the possible locations. In January 2013, the DJDC merged with the Jamestown Renaissance Corporation and former DJDC executive director Lee Harkness was hired by DJR as the train station general manager. His role was to find rentals, plan events, and find other uses for the space to help generate enough revenue to pay utility costs and other overhead, while DJR continued to seek out development opportunities. 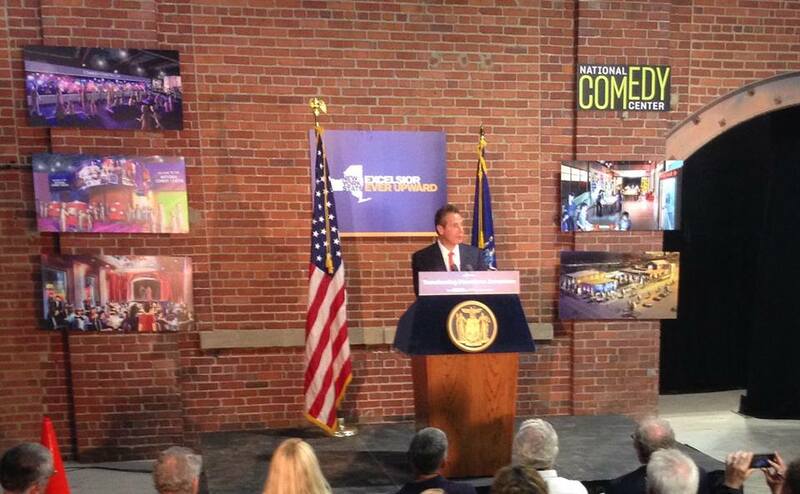 In December 2014, the NCC was awarded $1.5 million by the 2014 NYS Regional Economic Development Council. 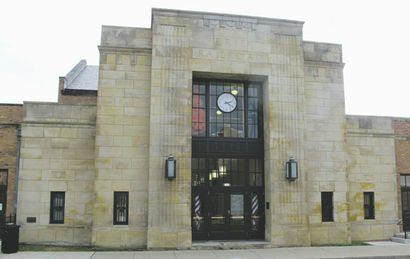 At the time, a description of NCC project said it is comprised of the adaptive reuse of both the train station in and a public utility / former trolley station building, along with construction of a new connecting building on the corner of Washington and 2nd Street to provide the necessary total square feet of exhibit space. In March 2015, the NCC purchases the Jamestown Board of Public Utilities former trolley substation at the corner of Washington and W. 2nd Street for $130,000 from the city of Jamestown. 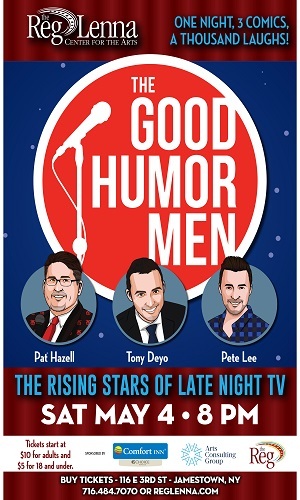 In July of that year, a groundbreaking for the NCC takes place during the 2015 Lucille Ball Comedy Festival. In December the NCC received $2.025 million from the 2015 NYS Regional Economic Development Council. 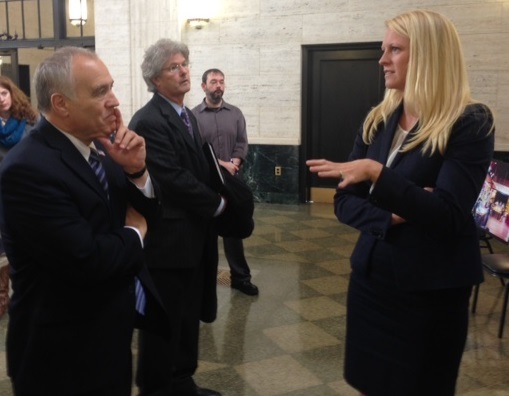 State Comptroller Thomas DiNapoli (left) listens to National Comedy Center director Journey Gunderson explain the mission and vision of the center, which is being built in Jamestown. 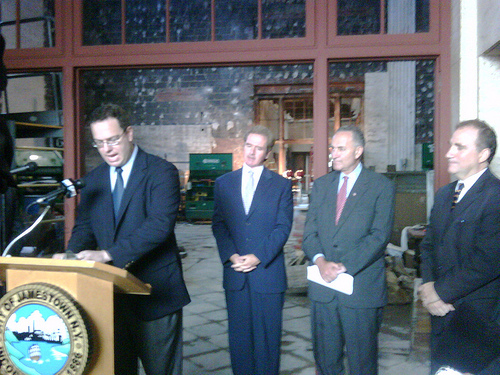 DiNapoli was in Jamestown in October 2015 to tour the location for the National Comedy Center and learn about various economic development projects in the city. In February 2016, the NCC enters a lease agreement with DJR and moves into the Gateway Train Station. The lease included zero dollars in rent and in exchange, the NCC would assume all operations of the property, including utilities and insurance, along with any needed structural repairs as well as scheduling events and activities. The mayor said the lease also included an option to transfer the property once the HTC five-year waiting period is over. Because of the federal funding tied to the project, the terms of the lease say the NCC must also keep the train station’s center concourse open to the public and available for public transportation usage. Once the NCC takes over operation, it decides to not keep the position of Train Station General Manager when assuming operations and Harkness is terminated. At the end of 2016, the NCC is awarded another $834,000 by Empire State Development. The additional funding follows awards of $2.025 million in 2015 and $1.5 million in 2014, bringing the total amount awarded by New York State to approximately $4.3 million. $600,000 of the awarded funds from Empire State Development are for continued development of the Center and adjacent Comedy Center Park, and $234,000 of the grant dollars are Market NY tourism capital funds. In February 2017 The IDA extends the PILOT agreement with DJR for one year to give the NCC an additional year to transfer the train station over to the non-profit. Gov. Andrew Cuomo at the National Comedy Center in Jamestown, NY on Aug. 3, 2017. By April 2017, the NCC received a $3 million grant from the Ralph C. Wilson, Jr. Foundation and a $5 million grant from New York State which was unveiled by Governor Andrew Cuomo in his State of the State Address as part of the Buffalo Billion II program. By May of 2017 the NCC secured all funding for its capital budget with the closing of a Federal New Markets Tax Credit transaction that provided the Project with approximately $5 million of equity funding. The $8 million from a month earlier provided the leverage that was required as the New Markets Tax Credit closing was predicated on having all other necessary funding in place. With enough funding secure and the 5-year HTC waiting period over, Teresi said the DJR board officially transferred ownership of the train station property over to the NCC at no cost in June 2017. The property value was listed as $500,000, but Teresi said because of the financial contributions the NCC had made between utility costs, insurance, and building upkeep – in addition to the NCC serving as an economic driver for other downtown development projects, the DJR board gave the property to NCC at no cost. The transfer was then finalized in August and with the property transfer complete and the DJR plan from 2010 realized, the for-profit corporation is no longer needed and dissolves. Despite the culmination of more than 25 years of effort to renovate and develop the train station, the seven years of work by DJR and its board spent toward finding a viable project for it, and the amount of fundraising required by the NCC to realize its vision and own the train station property, there was no public announcement by mayor Teresi, nor any media release announcing the property transfer or dissolution. The National Comedy Center in Jamestown, NY will open on Aug. 1, 2018. In April 2018, the NCC announced its grand opening will take place on Aug. 1, 2018. The Center, which comes with a combined cost of $35 million between the money invested in the Train Station, as well as the NCC build out, is expected to attract more than 100,000 annual visitors and have a $23 million annual stabilized economic impact on the region. 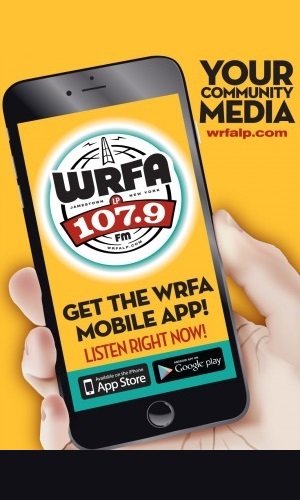 WRFA plans to tell more about the history of the National Comedy Center’s development in the summer of 2018 when we talk with NCC board chair Tom Benson.